Fine Decorative Wooden Jewellery Plate Available In Different Designs & Sizes. Use : For Any kind of food serve. & also use for Salad platter. Wooden Plates for Dining and serving purpose. 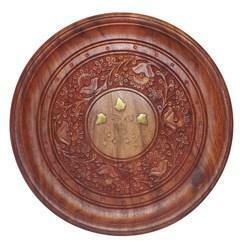 We are manufacturers & exporters of wooden chapping plate with brass decorative leave etc. We are a well-renowned organization in the industry to provide our patrons the best quality array of Wooden Plates. 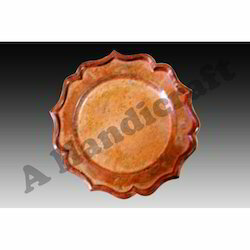 Wooden Plates offered by us are well known for their quality and durability. These Wooden Plates are fabricated by using qualitative raw material. These Wooden Plates are appreciated in the worldwide market. These Wooden Plates are offered at the market leading prices. We are offering Wooden Plates to our valuable clients at affordable prices. These Wooden Plates are made up of fine quality wood. Plate Size: 12" x 4"
Size of Biggest Letter: 1.5"